We are all aware of how important cables are for us today. Just as much as we depend upon electronics today, so much do our electronics depend on cables to work. So, directly or indirectly, cables are an integral part of our daily lives. Moreover, with the kind of pressures, temperatures, and withering that these cables experience every day, it is important that they are kept protected against all harsh environmental conditions; and the best way to do that is by shielding them. A shielded cable comprises of an insulated conductor encased in a conductive layer of material. The shield can be made from a wide range of materials like aluminum, steel, copper, polymer, or more, depending upon the type of cable and application. With such shielded cables, unwanted coupling into the cable assembly from an outside source can be prevented that also helps to reduce the overall radiated emissions that emanate from the cables. Signal integrity and emissions are thus improved. There are two main types of shielded cables available – foil shielded cables and braid shielded cables. Here, the shield is made of a foil layer, which comprises of aluminum or another effective conducting material, or a thin layer of copper. The material is spooled like tape and then wrapped onto the perimeter of the wire jacket in a helical pattern, which forms the shielding layer. The outer jacket is then applied. 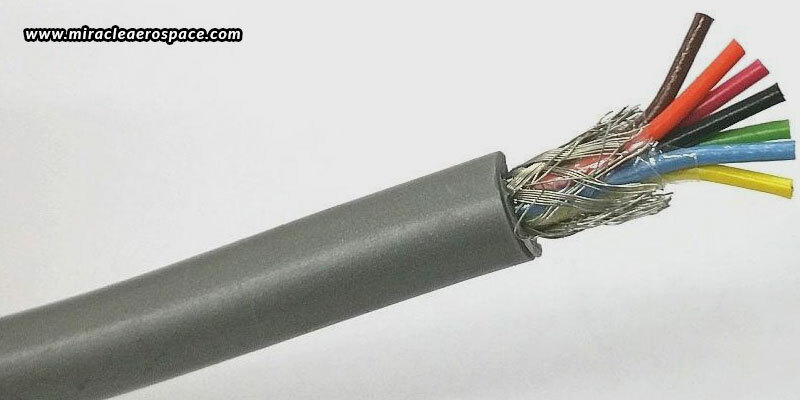 Such foil shielded cables have their conductors completely covered, which helps the cables to withstand even the highest frequencies (even greater than 100 MHz). These cables are light in weight and inexpensive. Here, a tightly woven lattice of thin material like tin or copper is used to totally encase the shielded cable assembly. Layers of individual conductive metal strands are crossed over the core of the cable or conductor, which are then encased in a jacket for maximum protection; thus offering the braided design. However, there is not complete coverage of the cable. The coverage may vary between 70-95%, depending upon the cable being used. This limited coverage and the gaps in the braids limit effectiveness at very high frequencies. However, such braid shielded cables offer more versatility, and are much flexible and strong. Thus, braid shielded cables are used in low to mid range frequency applications where the frequency range is up to 100 MHz, but also where strong and flexible cables are required. Both foil and braid shielded cables are completely viable options, depending upon what you are looking for. They both have their own pros and cons, and none is better than the other. Depending upon your application and requirements, you can approach aircraft cable assembly manufacturers in India to have the most appropriate cable assemblies made for you. If flexibility and strength is the major concern, braid shielded cables are the best choice. But, if your application works at very high frequencies, foil shielded cables should be your option. Miracle Aerospace is one such reputed and well-known manufacturer who is engaged in various Make in India projects like light transport aircraft, helicopters, cockpit harness, fighter jets, radar refurbishing projects, and more.